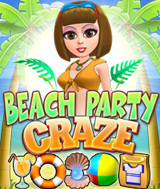 There´s no party like a beach party and there´s no game like Beach Party Craze. Cater to the needs of your sun-kissed clients as you manage every aspect of a swanky coastline getaway. From making sure everyone has a spot near the shore, to serving drinks, to renting diving gear, to building rides, to stocking your souvenir store, there are plenty of tasks to keep you busy and earn you money for upgrades. Take the role of Maria as she tries to outdo her best-friend´s spiteful ex in a contest to win a job with the owner of the resort in Beach Party Craze, a game so captivating, you´ll feel the sand between your toes. Pros: fun time management game! Cons: It was hard to figure out how to buy the last burger to get to get to the second level but once i did, i mastered the game! Comments: Fun game for kids and adults!